bookmarkd: should you make a yearly reading goal? 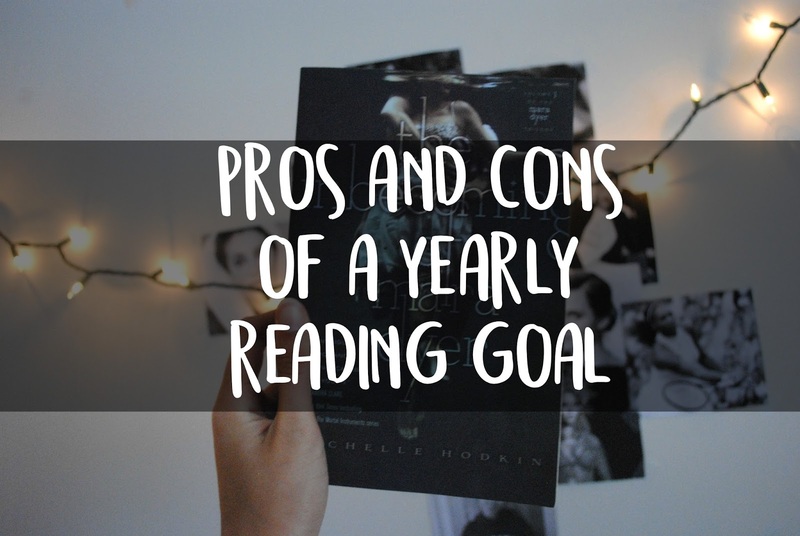 should you make a yearly reading goal? If you're on Goodreads, chances are you've set a 2018 Reading Challenge. SO HAVE I. My current goal is an ambitious 80 books, and I'm only one book behind right now, so that truly is an accomplishment. Reading challenges are fun, goals are fun, it's fun to have something to strive for. But recently I've seen the flaws in the whole system, or things that have made me slightly hasty to keep reaching for the goal this year. reminder that these are just personal opinions and how it is for moi. the one thing that motivates me the most is the thought of the feeling after I accomplish my goal. The idea that in December I'll open Goodreads and see I have read eighty books in one year makes me so incredibly excited that I think I'm going to go ditch this post and read. And the best part is I start to appreciate reading again! best. feeling. ever. honestly, if the Reading Challenge didn't exist, I don't know how much I'd use Goodreads :P I like to make sure that every book counts towards my goal. Goodreads always offers you the opportunity to comment when you're updating your place in a book and also lets you review after you read, and it makes reviewing feel less... difficult? It's right there for me, I can just type something and LOOK. I'VE REVIEWED. I honestly feel so accomplished after writing even the smallest of reviews. Like I did something good for the bookish world with my measly one paragraph review. counting how many books I've read and calculating how many books I need to read makes it feel like... not... a hobby? Maybe not exactly chore, but definitely not something that's CAREFREE and relaxing. "ohmyword I'm three books behind GO INTO PANIC MODE"
You're halfway through the year and you know there's no way you can read another 100 books in 6 months, you are ashamed, sad, you give up reading and become an anti literature monk. OK but it actually feels discouraging when you don't reach your goal, like what am I doing wrong? You could always change your goal, but sometimes that feels even worse. My goal is to read 100 books this year, I might raise it. i'm using goodreads for the first time this year, and i've set a goal of 75 books - mainly so i don't stress myself out too much! i like being able to look back at what i've read, but it can feel like you're being pressured into reading, for sure. I've given up on reading challenges years ago. I couldn't deal with the pressure of always being behind, and when I was ahead I was never far enough ahead, if you know what I mean. I've always thought (never counted my books before!) that I read around 100 books a year, so this year when I set myself a 50 book aim, I was fairly confident.. but Goodreads is telling me I'm 1 book behind already so eeek stressful! I definitely see the pros though, and think it's a fun way to remember all the books you've read!! But I'm that type of person who only wants to do something if there is an end goal so that is one of the pros to this challenge for me. Though, I TOTALLY UNDERSTAND HOW IT FEELS TO TURN YOUR HOBBY INTO SOMETHING THAT IS STRESSFUL. Because that's #notfun. I totally agree with you! I like goodreads goals because they keep my reading organized and I like keeping track of things, but gosh I just feel so overwhelmed sometimes with that number looming over my head! This year I’ve set my goal a little lower. I've also been thinking about the flaws in setting reading goals recently. I love Goodreads, and I love how the reading challenge motivates me to read. I'm also a big fan of tracking things and making lists, and having my reading all documented in a tidy little website feels great (I'd be making physical reading lists all over the place otherwise). Goal setting can also be really fulfilling, but it definitely puts pressure on something that is supposed to be fun. What I like to do is to always set my reading challenge to something I know I can achieve. That way I always exceed it. The last time Goodreads told me I was 1 book behind on my challenge was maybe 3 years ago! It's probably cheating, but it keeps me feeling good about my reading.